Wahama senior Johnnie Board, left, hits Waterford quarterback Peyten Stephens (12) during a pass play in the third quarter of a Week 2 TVC Hocking football contest at Bachtel Stadium in Mason, W.Va.
WHEELING, W.Va. — Four members of the Wahama football team were named to the 2017 Class A all-state team, as voted on by members of the West Virginia Sportswriters Association. The White Falcons — who went 5-5 this past fall — did not have a first or second team selection, but the Red and White had two special honorable mention and a pair of honorable mention choices for their efforts this season. Seniors Christopher Hesson and Christian Thomas were named to the special honorable mention list. Hesson was an interior lineman and Thomas was both a running back and linebacker for WHS. Seniors Colton Arrington and Johnnie Board were both chosen to the honorable mention squad. Arrington was a defensive back and a running back this past year, while Board primarily played linebacker. All four White Falcons were first-time selections to the all-state squad in Class A.
Hannan — the other Class A program in Mason County — did not earn a selection on the list following a 2-8 campaign. Brett Tharp of East Hardy was named the first team captain on offense and Adam Murray of Wheeling Central was the first team captain of the defense. 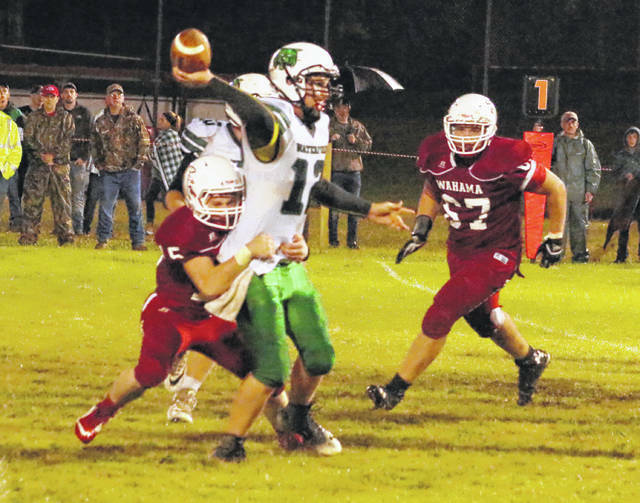 Brady Grant of Van was named the second team captain on offense and Luke Hardway of Webster County was the second team captain on defense. QB – Clay Skovron, East Hardy. RB – Jaiden Smith, St. Marys; Freddy Canary, South Harrison; Thomas Ferris, Midland Trail; Donavan Kirby, Madonna. OL — Nick Rush, South Harrison; Blake Neely, Williamstown; Timmy McCabe, Wheeling Central; Jeremy Smith, St. Marys; Nick Miller, East Hardy. WR – Brett Tharp, East Hardy (captain); Brooks Parsons, Magnolia. UTIL – Jonathan Blankenship, Tug Valley; Mark Rucker, Tyler Consolidated. K – Ryan Cunningham, Ravenswood. DL – William Howell, Doddridge County; Dylan Richmond, Sherman; Dylan Gray, St. Marys; Vinny Mangino, Wheeling Central; Andrew Richmond, Summers County. LB – Adam Murray, Wheeling Central (captain); Luke Jackson, Ravenswood; Cam Barnette, South Harrison; Mark Jordan, Pocahontas County. DB – Tucker Lilly, Summers County; Gunner Brummage, Clay-Battelle; Ryan LaAsmar, Notre Dame. UTIL – Trey Scott, Cameron; Matt Eichhorn, St. Marys. P — Colby Brown, Cameron. QB – Curtis McGhee, Wheeling Central; Kole Puffenberger, Pendleton County. RB – Brady Grant, Van (captain); Jordan Dempsey, Fayetteville; Jeremiah Johnston, Richwood. OL – Aaron Peterman, Wirt County; Carson May, Tug Valley; Tucker Dalrymple, St. Marys; Ryan Anderson, South Harrison; Tanner Sears, Valley-Fayette. WR – Travis Mickey, Cameron; Noah Minor, Midland Trail. UTIL – Griffin Phillips, Tyler Consolidated; Travis Dille, Clay-Battelle. K – Atikilt Tamiru, Moorefield. DL – Ethan Mahan, Ravenswood; Jared Barrows, Magnolia; Hunter Darby, Midland Trail. LB – Dawson Wear, Wheeling Central; Phillip Mullen, East Hardy; Shane Peacock, Pocahontas County; Elijah Barner, Mount View; Curtis James, Doddridge County; Luke Hardway, Webster County (captain). DB – Christian Pack, Summers County; Ethan Burgess, Buffalo; Aden Funkhouser, East Hardy. UTIL – Bray Price, Wheeling Central; Ben Salmon, Sherman. P – Tanner Lett, Doddridge County. Hunter America, Doddridge County; Brent Barnette, South Harrison; Jakob Barrows, Magnolia; Tucker Bennett, Summers County; Elijah Benson, Ravenswood; Will Bragg, Richwood; Hayden Burdette, Richwood; Parker Brewer, Tug Valley; James Cava, Notre Dame; Elijah Collier, Mount View; Garrett Cook, Madonna; Max Cook, Doddridge County; Tristan Coots, Fayetteville; Ryan Cross, Paden City; Seth Davis, Doddridge County; Ryan Ekey, Madonna; Levi Hardway, Webster County; Carter Haynes, Williamstown; JT Hensley, Sherman; Antone Herring St. Marys; Critter Hesson, Wahama; Caleb Jantuah, Richwood; Matthew Jenkins, Moorefield; Hunter Jones, Midland Trail; Cordell Lesher, Midland Trail; Landon McFadden, South Harrison; Jeff Mills, East Hardy; Ben Neal, Summers County; Hunter Partridge, Magnolia; Chad Ramsey, Greenbrier West; Cole Rapp, Tucker County; Brett Reall, Tucker County; Caleb Richmond, Meadow Bridge; Andrew Ritchea, Cameron; Anthony Robbins, Wheeling Central; Dakoda Sager, East Hardy; Mike Shreves, Paden City; Levi Streets, Valley Wetzel; Joey Taylor, Tygarts Valley; Christian Thomas, Wahama; Tim Thorne, Pendleton County; Willie Walden, Tygarts Valley; Dakota Waldron, Mount View; Briar Wilfong, Pocahontas County; Wyatt Wingrove, Cameron. Nick Adams, Midland Trail; Hunter Amick, Richwood; Evan Amos, Williamstown; Colton Arrington, Wahama; Adam Baker, East Hardy; Johnnie Board, Wahama; Hunter Booth, Pendleton County; Stephen Booth, Buffalo; Hunter Bouldin, Montcalm; Ben Callaway, Tucker County; Layne Daniel, Sherman; John Dickens, Sherman; Colton Dorsey, Greenbrier West; Luke Duplaga, Wheeling Central; Logan Forquer, Clay-Battelle; Logan Frantz, Fayetteville; Daniel Gibson, Van; Logan Gogan, Doddridge County; Jake Greene, Ravenswood; Aaric Gross, Mount View; Gunnar Haley, Gilmer County; Jared Harman, Pendleton County; Jimmy Harper, Valley Fayette; C.W. Harton, Paden City; Will Hensley, Sherman; Max Hilton, Ravenswood; Chance Lemley, Madonna; David Joy, Paden City; Tyler Kocher, Valley Wetzel; Austin Lowe, Valley Wetzel; Noah Lucas, Tug Valley; Harley Martin, Meadow Bridge; Park Michaels, Buffalo; Tyler Morlachetta, Buffalo; Brayden Mullenix, Williamstown; Josh Newsome, Tug Valley; Reece Nutter, Webster County; Jarred Parnell, Montcalm; Cordell Parsons, Sherman; Aaron Pendry, Mount View; Garyn Pritt, Valley Fayette; Luke Poling, Tucker County; Owen Poling, Tucker County; Trent Pullens, Fayetteville; Mac Raymond, Madonna; Dakota Richards, Wirt County; Sam Romano, Notre Dame; Dillon Shinaberry, Pocahontas County; Braden Snyder, Richwood; Benji Steele, Clay-Battelle; Kyle Sturgell, Tug Valley; Jake Tackett, Tygarts Valley; Donathan Taylor, Williamstown; Zak Tokash, Madonna; Daniel White, Tygarts Valley; Dustin Williams, Webster County; Marcus McGuire, Summers County.